I read this book by Laura Vanderkam last year. It's not a typical time management book, a lot of it reviews research about how Americans think they spend their time, versus how they actually spend their time, as well as how time use has changed over the past 50 years or so. I find this day-to-day stuff about human behaviour fascinating. In a nut-shell, Americans sleep more than they think they do, and work a whole lot less than they think they do. There's lots more, obviously, and I liked it a lot. 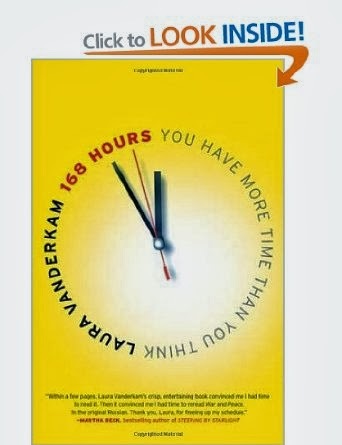 The title of the book comes from the fact that there are 168 hours in a week. Isn't it weird that we don't know that number off the top of our heads? I know that there are 24 hours in a day, 7 days per week, 365 days in the year, and that a typical day would include 8 hours of work and 8 hours of sleep. But I would have had to calculate how many hours there are in a week. When I then start adding things up -- work at 35 hours per week (I realise this is low for a full-time worker, feel free to hate me), sleep at 56 hours per week -- that still leaves 77 hours. That's a lot of time. I am confident that my time management at work is pretty optimal. It's one of the reasons I can get away with 35 hours. (The other main reason is that I am medium-successful rather than super-successful, but that is surely a topic for another day.) I don't think that I manage my personal time nearly so well. And I'm not even sure where all that time goes. For some concrete accountability, I "volunteered" to track my time for Laura's Mosaic project. Actually, I bullied her into accepting me, as I don't actually fulfil the income criteria. I'm going to start on Saturday or Monday, I'm not sure. Obviously the Hawthorne effect will be at work -- I won't be able to help myself trying to make it an ideal week, rather than a typical week. For the next few days, I'm going to test out a time tracking app or two, versus recording on paper. 15 minute intervals? 10? 20? 30? I would love to hear from anyone who has any tips! You are so right! I just e-mailed her and pitched my case. It took her awhile to get back to me, just to warn you.